I stare down at the neatly aligned paper on my desk. Four precious sheets of petal-thin pages, no grey smudges, no torn edges, just sweet, straight lines stretching idly over snowy, white oblivion. I feel as though I can see miniature petpets marching ceaselessly over those lines. And they are taunting me – rolling their eyes, stamping their feet, distracting me from my task so close at hand – I need to focus. But the more I try to focus, the more I feel like some kind of mechanical transmitter – picking up all the little noises from the world around me. I hear the whistle of the Neomailman as he passes by our house, the jingle of bells and the laughter of my own Neopets downstairs, doubtlessly causing some kind of havoc. I wonder vaguely if I should check on them, just to make sure the couch is still inanimate, but my hand twitches in defiance, holding the red pencil upright as if to say, ‘Don’t you dare leave.’ You’d think a hand this independent would have some first-class ideas, but so far no words have been conjured to lie, like sleeping gallions, on the paper that so cruelly watches my struggle. I sigh and softly tap the pencil on my desk a few times; each knock leaves a tiny grey indent in the wood, like footprints. The noises it makes sound like a secret code – the kind you might expect the Defenders of Neopia to use in their covert headquarters. What an exciting life that would be – fighting, winning, becoming a hero – you would even have something to write about! Another sigh. Glancing out the window, I see my neighbour sleeping in a patio chair, soaking up all the available sunshine. Her dreams are probably far more interesting than any idea I have come up with in the past hour at my writing table. I wish I could write about my dreams, but no matter how hard I try, they always leave my memory dry when I awake, slithering out of my grasp like sly scamanders. I am still gazing absent-mindedly out of the window when I see it. The lightest feather, creamy white and beautifully formed – swirling and swooping in its plummet back to earth. A reminder of the reason I am sitting in this room, on a chair at this desk, with this pencil in my hand and this paper in my reach. 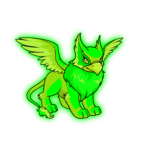 The Neopian Times Star avatar. Rare, but stunning. The ultimate avatar, reserved only for those with remarkable talent and consistency. Something I have sought after for a long time, an avatar that I desperately want. I yearn to show off the delicate feather quill that so gracefully curves over simple, but alluring, letters. I want to claim the golden outline that encases the plume as my own. Ten stories is all it takes. Ten. It shouldn’t be this hard! The voice is razor-sharp and I groan in disappointment, I had been so near to an idea, but now I can’t remember anything about it. The voice continues, I recognise it as Sploodgey’s, my plushie Gelert. “Lion? Hey, Lion! What are you doing? I need to find Goox! Lion? Lion? Lion?” He has moved to stand beside my chair and I glance down at him as he barrages me with a hyperactive attempt at catching my attention. “What do you mean?” he quizzes me, perplexed by my frustration. I look at him, shocked. How could I have overlooked such simple and yet exciting things? “Sploodgey, you are a true genius!” I lean over and squeeze him tightly. He wriggles free and gives me a playful scowl. “Whatever!” He pulls a face at me and flippantly swats his scruffy paw across my shoulder. Then he’s off, dashing through the door calling for Goox, his grey spardel. I return to my intimidating sheets of paper and lift my pencil right up in the air, preparing to strike. It comes down with a flourish and words appear – like an enchantment – on my previously blank page. I revel in the feeling of my wrist flicking at each letter I write – this is the moment I have been waiting for, when I can finally begin my journey to that intangible avatar. I am unstoppable; nothing could possibly interrupt me until my pages are full to the brim with delightful A, Bs and Cs accompanied by commas and semicolons to keep everything in order. The paper I once saw as hostile is now my friend, guiding my pencil on a direct route across the lined bridges. My ears cannot hear any sound but the scratching of graphite as it traverses the page in loops and swirls. I am blind and deaf, but my hand is not. I know that tonight I will dream of golden quills. Tonight, I will dream of sturdy bridges. And maybe, if I’m lucky, I will remember these dreams, because now that I have started there is no way to make me stop. That is, unless I hear a snap and something grey and slightly blunt rolls out from under my pencil only to tumble over the edge of the desk. ...Tomorrow, I buy a pen.